Visual art can make manifest what discursive language is ill suited to convey. whilst I sat bound to my wheelchair. the ethereal light … yet a light without detail. A light of unknowing. Open. Knowingly relinquishing … into a lightness of Being. Accepting the wheelchair had been such a hurdle. Its own leap: over the barriers of pride and independence. Grace called for me in all my constraints – the now-me – to leap into a new place of abandonment. unexpected beauty,” writes an art critic of Only Say the Word. ensconced in a wheeled chair, other times outfitted in a barely visible brace. can’t latch on to visible signifiers. Grimm’s figure is alert, attentive, in that holy leap. 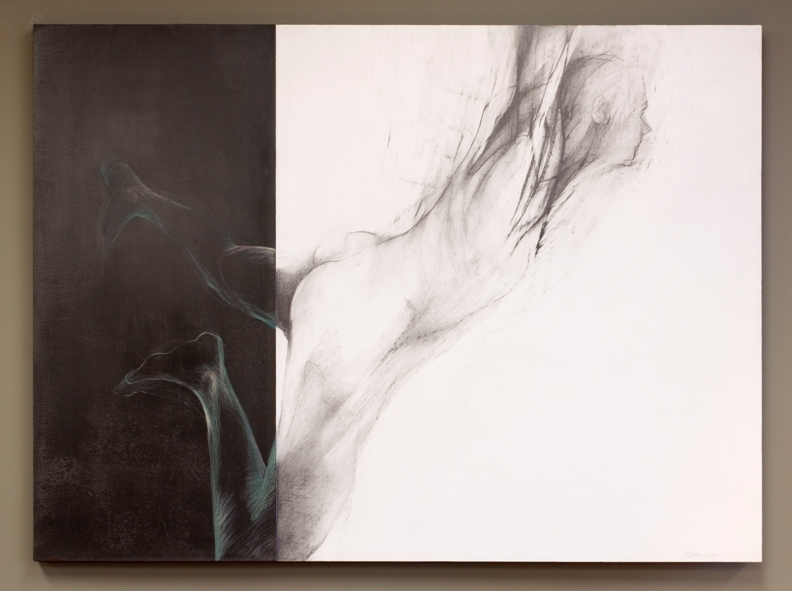 Erica Grimm: Only Say the Word, 2002, 44 x 60 inches, steel, graphite, pastel on board. Erica Grimm was raised in a Catholic home, in the prairie province of Saskatchewan, Canada. She studied Art at the University of Regina(of which she is now a Distinguished Alumnae), Banff School of Art, and Akademie der Bildenden Künste in Munich (discovering in her Life Drawing classes that “drawing is another word for prayer”). Now a practicing Anglican, Grimm is Associate Professor and Chair of the Art + Design Department at TrinityWesternUniversity in Langley, BC near Vancouver. Her doctorate – enquiring into the epistemological implications of visual processes – will be published as The Aesthetics of Attentiveness: A Philosophy for Artists and Educators (Wilfrid Laurier University Press). Both Grimm’s images and writing have been influenced by Simone Weil – by her explorations of the paradoxical co-existence of beauty and affliction, wherein lies the image of a relationally desirous God. Grimm is well known for her combinations of encaustic painting using pigmented heated beeswax with planes of steel. Her more recent work juxtaposes a variety of materials and signifiers, including multimedia. Drawing remains at the core of her work. Steel, lead, gold; ash, wax, salt; maps, texts, and medical diagnostics explore interiors and exteriors, expressing embodiment and liminality and showing “how material surfaces (and sounds) unfold depth and collide to create meaning.” Grimm writes: “In the contrast between these things that don’t necessarily belong together, sometimes a new meaning arises. That’s the crux of my visual investigation.” She has over 25 solo exhibitions and is in numerous private and public collections around the world, including the Vatican Art Collection and Canada Council Art Bank. In 2002 Grimm was awarded first Prize of the Imago National Juried Art Competition for Only Say the Word. Many of the works from a recent exhibition in Regina (October 2013), titled Laughing Medusas and Other Saturated Phenomenon, may be viewed at the Assiniboia Gallery site (url given below).